Happy first birthday to your blog! Hope you stick around for many more blue moons and ice orchid blooms! It seems I enjoy ice trucks. Thank you, chlost. According to one website I checked, the next blue moon is in 2015. I’m afraid I might run out of words before that. At least you don’t have to buy video games for your words, to keep them from being bored…Beautiful orchid, btw.. The orchid is amazing. It’s really my daughter’s, but she left it here when she moved out and I’ve been tending it ever since. You still keep a tidy desk.. I love your humour, your honesty and your amazing writing! I still am hoping for a book…I could say I didn’t know her when…but I knew her writing. You are one of the bloggers I am happy to have met. Thanks for your encouragement. I have enjoyed your writing and your….ummm….unconventional wit. (Hey, that’s better than being witless, isn’t it?) Love your attacks on the English language and especially your wonderful vacation (with the pidgeons!) that allowed me to enjoy the locations without paying my fare. When I went on a real vacation this year, my exuberant neighbor watered my orchid every day and of course, it died. Perhaps you can resuscitate so it’s as beautiful as yours? Happy birthday to your blog! I really hope you will never stop dressing up your words and sending them out 🙂 Lovely orchid! Thanks, Iltana. I’m glad I found your blog and have been able to enjoy the beautiful images you post. Here’s to the next year of dangerousity. Snoozer, thank you for the many laughs. You dress your words so beautifully they deserve a fashion runway of their own. Congratulations on your very successful first year. Here is to many more! Reading your blog has not been dangerous for me, but pure joy! I don’t believe I”ve even stumbled over your words…only my own. 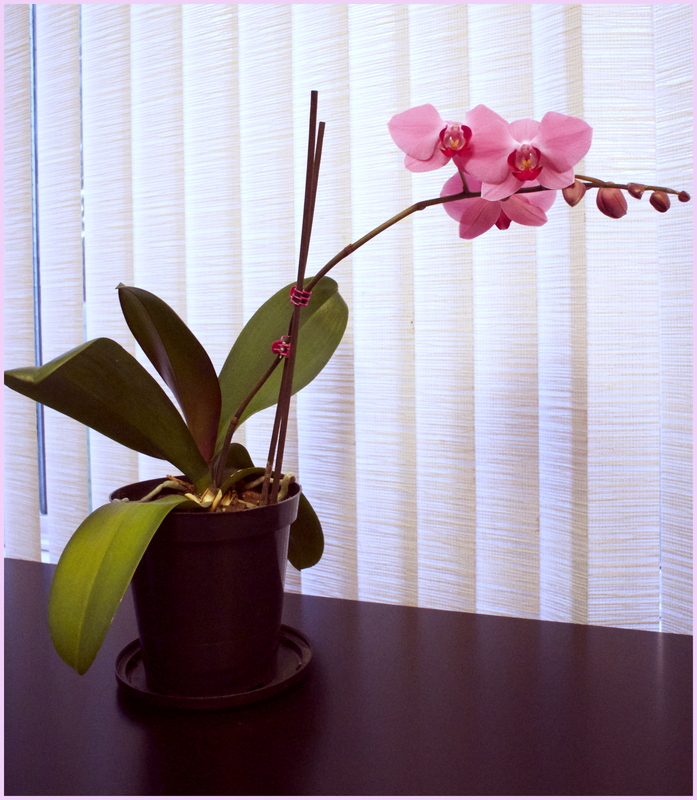 I don’t care about anything else…I just want to know how you got your orchid to rebloom! This spring two stems sprouted. When I tried to clip them on the sticks, one of them broke. I almost cried. The surviving stem produced 9 blooms. Then a month or so ago, I noticed a new stem. Maybe all that energy from the broken one had lain dormant and had to burst forth. It’s possible, of course, that the second stem and second blooming have nothing to do with the broken one, but it comforts my heart to think it was reborn. Happy Blog Birthday. I have enjoyed your words – keep it up. Congrats, YS, and happy birthday to your blog! I hope this next year is even more fruitful and maybe a little bit fearless. You are a wonderful writer, a lovely person, and an amazing talent. I can’t wait to see what you do next! You are one of the bloggers who have encouraged and challenged me this year, Courtenay. You set a high standard. I had not realized you were so new at blogging. I’ve enjoyed many of your posts whether I’ve always commented or not. Congrats on reaching a year. Thanks, Terri. Since I am old at living, it cheers me to think I’m still new at blogging. I always look forward to your comments, 35. (Is that Agent 35?) You are a great encouragement. Thank you so much. I’m glad we’re in the bloghood together. I’m also glad you started blogging! I can sincerely say it’s been my pleasure to spend this last year with you, and I’m looking forward to what the next year brings. It’s been my pleasure to have spent this year with you, too. Well, I’m always late to the party,but I wish you congratulations as well. I’m very glad you have decided to live dangerously and write for all the world to see, It’s been a true pleasure to dip into your blog posts and experience your writing. I’m looking forward to what comes next. Thanks so much, Maria. It’s been my pleasure to meet you online. Congratulations, my dear yearstricken, on a year of blogging. I love your blog, and love your writing, and each post is a pleasure for me. Reading is not dangerous… it’s the easiest thing in the world, for we all have built in filters, and make our own choices about what we’re willing to expose ourselves to… and what we’re willing to deal with. But in writing, we sometimes open doors and windows that expose some of the most private and sensitive parts of our souls. And so, writing can be ‘living dangerously’, and I consider you a true writer; who often touches one of those universal threads that wind their way through many of us. I’m grateful to have found you, and I wish you many more years of blogging. Thank you, ShimonZ. I am so glad I found your blog as well. Writing is a dangerous enterprise, but ultimately worth the risk. My gravatar would like to wish your gravatar a Happy First Anniversary. We are all looking forward to your next year of writing! Nice, this encourages me to press on with wordpress and keep blogging, Thanks. Thank you for reading. I’m so happy to hear that it encourages you.